On Saturday night in Indianapolis, the Wine & Gold play their final road game of the unofficial first half of the season – looking to even the season series in the final meeting between these Divisional rivals this year. On Friday night in D.C., the Cavaliers fell into a 20-point first half hole and spent the rest of the night trying to rally out of it – cutting the deficit to just three points late in the third period before succumbing to the new-look Wizards, who evened the season series with the win. The Pacers have righted the ship after losing Victor Oladipo to a season-ending knee injury in late January. After dropping the first four games after the league’s reigning Most Improved Player went down, the Pacers have now won four straight – beating down both Los Angeles squads here in Indy this past week – including a 24-point win over the Clippers on Thursday night. Indy has taken two of three against the Wine & Gold this season, but the Cavaliers have beaten the Pacers here already this year, taking a 92-91 thriller on Larry Nance Jr.’s tip-in at the buzzer. They’d love to get another one on Saturday night to close out the season series in style. Coach Larry Drew has told rookie guard Collin Sexton that there’s more to the game than just scoring the ball. And while the former Alabama star has worked on those other facets, he’s been very good at simply filling it up over the past two outings. On Friday night in the nation’s capital, the Young Bull tallied 27 points for the second straight game – having gone for 27 (through the first three quarters) against Boston on Tuesday night and doing some of his better work late against the Wizards – scoring 15 of his 27 after half and six in the fourth quarter, going 10-of-18 from the floor, including 3-of-7 from deep and 4-of-4 from the stripe, adding four assists and three boards. In that two-game span, Sexton is shooting 50 percent from the floor, 43 percent from long-range and a perfect 6-of-6 from the stripe. Darren Collison, who led the league in three-point shooting a season ago, is having another solid campaign in his second tour of duty with the Pacers, leading Indy in the assist department for the second straight year. As good as he’s been over the past couple seasons, the Cavs have kept him under control – holding him to single-digit scoring in two of the three meetings this season. Despite missing 11 games earlier in the year, Victor Oladipo was off to another All-Star campaign with the Pacers. But when he went down with a season-ending knee injury on January 23 against Toronto, the Pacers were desperate to find another primary scorer. And in Oladipo’s absence, Bojan Bogdanovic has stepped in to fill the void. The top pick of the second round in 2011, Bogdanovic – who’s started all 55 of Indy’s games this year – has averaged 24.5 points on 58 percent shooting over this last week – dropping 24 and 29 points, respectively, on the Lakers and Clippers. He’s been about that good against the Wine & Gold this season – averaging 20.7 points on 55 percent shooting through the first three meetings. All season long, Larry Drew has been forced to go with some odd lineups and he’ll have to get creative again on Saturday night. Kevin Love, who returned from a 50-game absence on Friday night in D.C., will not see action again on Saturday. And Bogdanovic is a lot to ask of last night’s starter, Deng Adel. With that in mind, David Nwaba will likely get a shot against him, with Cleveland trying to take advantage of Nwaba’s strength and athleticism. Nwaba’s been solid since returning from an 18-game layoff of his own – averaging 12.3 points in three games back, including a 17-point effort on Friday night in D.C., going 6-of-11 from the floor to go with eight boards and a pair of steals. 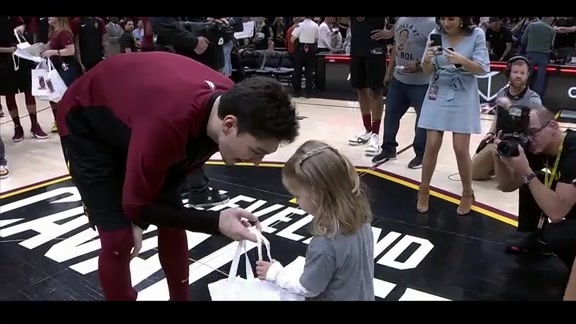 Kevin Love got the start in the middle on Friday night, but after a quick seven-minute burn was done for the night. Ante Zizic stepped back into the center spot to start the second half and had a quiet evening – finishing with six points and a rebound on 3-of-4 shooting. Big Z had been playing well as a starter – netting double-figure scoring in six of his nine recent starts and grabbing double-digit boards in each of his last three outings. With Tristan Thompson still on the shelf, it’s likely that Zizic gets back in the opening lineup tonight in Indy – and he’ll have his hands full with Myles Turner, the longest-tenured Pacer and the league’s shot-blocking leader at 2.74 swats per. Turner has played in two of the three meetings with Cleveland this year, doubling-up in the last game and blocking seven shots in the two outings combined. 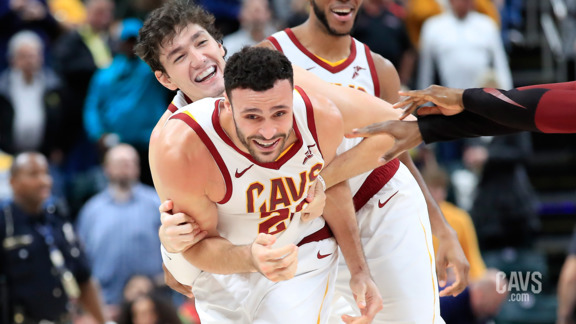 With the always-dangerous Thaddeus Young starting across from Turner, the Cavs might need to go with Larry Nance Jr. in the starting lineup again. Nance has been excellent of late – putting up his fourth straight double-double on Friday night in D.C., finishing with 10 points and a game- and career-high 19 boards, nine of those off the offensive glass, to go with team-highs in assists (six) and steals (three). Nance, who tipped in the game-winner the last time these squads tangled in Indy, averaged an even 15.0 points and 14.0 boards through the first two matchups this season before injuring his right knee early in the last meeting. The Cavaliers' bench was good-but-not-great on Friday night, but the unit did get a nice lift from the newest Cavalier – Marquese Chriss – who chipped in with 13 points and eight boards in 23 minutes of work. The Wine & Gold also got another outstanding performance from their leading scorer, Jordan Clarkson, who bounced back from one of his roughest outings of the year on Tuesday against Boston – finishing with 24 points in 31 minutes off the bench, going just 6-of-18 from the floor, but 10-of-11 from the stripe, adding six boards and three assists. Aside from Chriss and Clarkson, the only other Cavalier to score off the bench was Ante Zizic. The Cavs might need more production than that across the board on Saturday night against the deep Pacers, who have one of the better reserves in the league in Domantas Sabonis, who’s improved in each of his first three years out of Gonzaga. Indy’s second-leading scorer, Sabonis has been rock-solid in all three games against Cleveland this year, averaging 15.7 points on 55 percent shooting. The Pacers have another outstanding reserve in Corey Joseph – who notched 13 points in each of the two wins over LA this week.